Beyond the GM’s screen lies secrets and treasures the average PC would kill to possess. 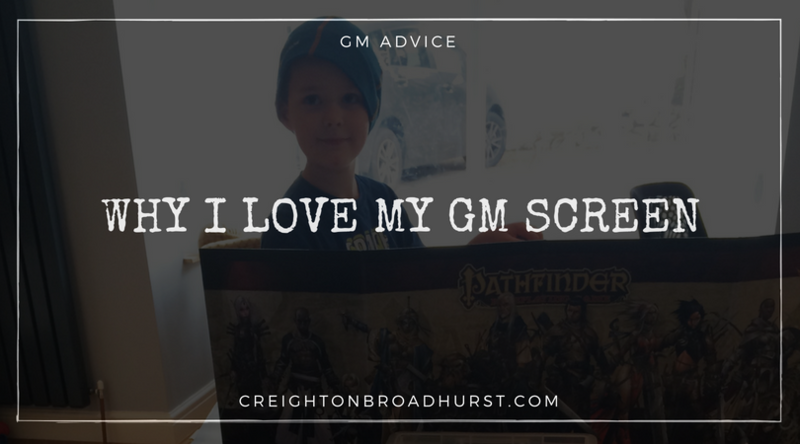 A GM screen is a vital part of any GM’s kit. With a myriad of uses, a screen makes a GM’s job infinitely easier. I’ve used one throughout my Borderland of Adventure campaign and found it immensely useful. In the old days, I used to use the actual box of whatever game I was playing, or sometimes even a box file. Currently, I’m using a more traditional GM’s screen. In whatever format, a GM’s screen’s primary function is to create a small area of table space which the players cannot observe. It acts as a focal point and serves as a non-verbal cue for players to focus on that area of the table. Rolling in Secret: Some dice rolls just need to be rolled in secret. My rule of thumb is that if knowledge of a roll’s results would affect a player’s subsequent actions, I roll it behind the screen. For example, in Pathfinder, such rolls include all Knowledge, Perception and Stealth checks. Of course, these days a GM could roll on an iPad or similar device, but I’m a bit of a Luddite at the gaming table. While tablets and so on are incredibly handy for carrying loads of rulebooks and so on they are distracting. As a GM, I want to focus on the game and the players and not my shiny device. Hiding Stuff: Generally, it’s a very good idea to make certain the players cannot see the dungeon map, monster statistics, the pile of pre-sorted miniatures and so on. Having a screen enables a GM to keep all that kind of stuff easily to hand (and hidden). Sure, you could hide them elsewhere (in a bag or wherever) but it’s not as convenient. Displaying Art & Maps: A GM can affix relevant art and maps to the players’ side of a screen. Doing so saves table space, keeps them always available and enables the PCs to see them at a glance. In the past, I’ve also added NPC lists, a summary of the current adventure’s objectives and more to the screen to help the players. Notes: For me, post-it notes are one of the unsung heroes of my GM kit. The inside of my screen is often festooned with them. I use them for aide memoires, to note who got infected by a disease, little-known rules, page references and more. Even better, they are movable so if the post-it note obscures the table I need, I simply move it. It’s also very hard to not spot a bright yellow post-it note stuck to my screen. I’m always looking at ways to get more out of my GM screen. I recently realised that as well as using them to list rules and so on, I could also create inserts to help me dress my dungeons more effectively (and to help create the illusion of detail). And thus, the GM’s Screen line was born! 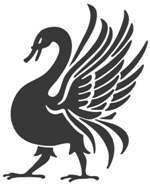 At the time of writing, Raging Swan Press has released six instalments in the line. I’ve found them tremendously useful and I hope you do too! Do you use your GM’s screen for something else? Do you have hints or tips about how you use yours? Leave a comment below and help your fellow GMs get more out of their screens. Love my DM screen! Problem is, I’m creating one in a landscape format. I have the artwork for a 4 panel screen, but no ‘tables/charts’ to put on my side! I’m a huge fan of landscape GM screens. I find portrait ones make it harder to see the battle mat – and even other players. Good luck with the charts. I experimented with custom landscape charts. I’ll try and see if I can find them. Sorry for the 5 year delay (I just recently found this page) but make your own. I prefer this over the published ones because I do a lot of house ruling and home brewing, my stats don’t match the book, plus I can put the tables and charts I prefer on there. I just do them in excel, then format how I like (add borders, shade rows, etc. ), then copy into Word or other word document template and move them around how I like. I gotta say I like having a table of random treasure on my DM screen. My players inevitably surprise me with their creativity or engage in otherwise unexpected actions and I like to reward enterprising roleplaying. It is just too boring to say…”You find a sack of 50gp in the belly of that monster you (shockingly) disemboweled” and much more interesting to find perhaps a slightly bent wand of magic missile…which maybe has a chance of backfiring on the caster! This is a genius idea! I love the idea of a bent wand of magic missiles. Hilarity would no doubt ensue! I built the center section of my “ultimate DM screen” last weekend. Still need to complete the wings. The players’ side is foamcore with epoxy putty sculpting of a stairway down into the dungeon that switches back halfway down the screen. 9″ high by 12″ wide for landscape charts. Stairs 1″ deep, 1/2″ high, so the minis can stand on them. Fits well with Dwarven Forge scenery. I love Dwarves Forge scenery. I’d love to get a look at your screen when it’s finished. I bought the Dn screen for the game torchbearer rpg the one they have is awesome heavy duty and not tall at all so your dont feel cut off from the game. Across the top of my GM Screen is the list of months, days, day of the week, and time of day (broken into Morning, Afternoon, Evening, Night, Late Night) I keep paper clips on the appropriate part. So the players are able to follow along with the flow of time. I try to keep artwork for NPCs the players will encounter. Either clipart, artwork, or photos from the net. When they encounter someone I will paper clip that NPC to the back so they can see him/her. Biggest problem I have is when the paperclips come off between games. Ugg I hate that. I’ve been “guilty” of using the player-facing sides of my GM screen in the same way. I also often include a map of the local area so the PCs know where they are roughly. I like the idea of including campaign-world specific information on that side of the screen as well. I would never ever never EVER:) play a game without a screen…it’s a mandatory requirement I think:)….I think though the screen is on the decline, especially 4th edition on…I’ve sessions where every one just sit around a table playing on laptops or what not, no dice being rolled, nothing ‘hidden’ I mean why bother?? playing?? ?the DM needs to ‘separate’ their ‘world’ from the pc’s world….well that’s my opinion:)..
I’ve been using screens ever since they came out….and ever since those monster cards came out in the late 70’s early 80’s what I’ve done is take the screens and separated them and put a tube or dowel what have you and put the card on the thing there in between the screen…..I also use the back side of the screens for post it notes or again what have you.. I know it probably sounds corny but if I catch any one looking behind my screen the PC get put on an irritating geas or quest spell from their diety lasting a game day…they might have to find a pig or something but it’s all in fun….. I agree with and use all of that. One other use, which has become a new rave, is the hanging of initiative cards along the top of the screen. My groups and I have found this to be very helpful in keeping everyone on track and ready for their combat turns. I find using colored index cards helps differentiate between characters and enemies. Bonus: Having combat stats hanging in front of me is invaluable! I like this idea! Thanks for posting it up! Nice. I’ve always used Initiative Cards. Custom Printed & laminated 4×6 cards with character names and some artwork. I hold them and flip thru them during combat, I use generic NPC or Blank ones to rep monsters etc. And an End of Round to signify the end of a round. I use the player side to hold a list of Savage Worlds (my usual system) most commonly used options such as how grapple works, or hitting a bystander when rolling one on attack die or using wild attack. It’s I huge print so everyone can see it. I have similar info on things I as GM regularly need such as the incapacitation table. And I use sticky notes for reminders for single use NPCs whose abilities I might overlook. Love having a screen. It helps create atmosphere! I do a lot of my rolling in front if the players but sometimes I have to roll in secret. And sometimes I just roll for the HELL of it & scare the players. I have maps and other secret materials stashed behind it. I stage miniatures and other props. I’ve been using Game Force Nine’s Dungeon Masters Keep screen for years. I have a custom made 5 panel wooden one with magnets and a bunch of bells and whistles that I take on the road with me. Your Naked Without A Screen. Don’t Be A Naked DM! Blimey! That would be an awesome, but rather expensive GM’s screen! I clearly need one! If only I had space at the table! I end up using my monitor as my GM screen and it’s both a blessing and a curse. Anything that I want to hide is done the old-fashioned way: my handy clipboard with tiny writing and some random paper smacked on top.